This holiday season, give the gift of good food while supporting local farmers and food crafters. At CUESA’s farmers markets, you’ll find the makings for wholesome winter feasts, along with unique gifts that nourish the body, the earth, and our local community. We’ve gathered some ideas for delicious and distinctive stocking stuffers and host gifts, as well as fixings for creating a sustainably sourced goodie basket. These are gifts with real people and stories behind them. At the farmers market, you can meet the makers, learn about their crafts, and know that you’re helping family farmers and small food businesses thrive. As the days turn cold and rainy, farmers market vendors count on loyal customers like you to help sustain their businesses year-round. In this time of gratitude, we thank you for supporting CUESA and our market community throughout the year. Happy holidays from CUESA! The Ferry Plaza Farmers Market is OPEN throughout the holidays EXCEPT Tuesday, December 25; Thursday, December 27; and Tuesday, January 1. Jack London Square Farmers Market is OPEN throughout the holdiays EXCEPT Sunday, December 30. Using heirloom apples from their Sebastopol farm, Little Apple Treats has made a name for themselves with their Good Food Award-winning apple cider caramels. Look for seasonal flavors California Candy Cap and Apple Brandy + Walnut. They also offer apple bark, granolas, and apple vinegar shrubs (in seasonal flavors like Roasted Pink Pearl Apple, Concord Grape, and Spiced Quince and Clementine). Featuring organic heirloom roses from the farm, hibiscus, dried apples, and vanilla beans, their Modern Mulling Spice will add holiday cheer to hot cider and wine. Ferry Plaza, Saturdays. Fall is the time for harvesting walnuts, which means they’re as fresh as can be at the farmers market right now. Glashoff Farms’ Good Food Award-winning walnut oil, made from Franquette walnuts, adds a rich, toasty flavor to dress up any winter dish. Ferry Plaza, Saturdays. For holiday snacking, fifth-generation San Joaquin family farm Old Dog Ranch offers bags of raw walnuts, as well as flavors like Mexican Hot Chocolate, Whiskey Spice, and Rosemary. Grab-and-go gift bags with a sampler of their walnut butters and spiced walnuts are also available. Ferry Plaza, Saturdays. Bringing a contemporary twist to Christmas food traditions, June Taylor sources from local farmers for her distinctive holiday treats, such as mincemeat (traditional or vegetarian), Nordic herbal syrups, and citrus peel candies. Her legendary Christmas cake takes a whole year to prepare, with different fruits being preserved each season. Ferry Plaza, Saturdays. Swanton Berry Farm makes a wide variety of low-sugar organic jams using berries grown by union labor on the California coast. Recognized for its commitment to social justice for farmworkers, Swanton is one of the few farms in the country to carry the Food Justice Certified label. Ferry Plaza, Saturdays. Give the taste of summer with Frog Hollow Farm conserves, featuring the farm’s popular Brentw0od-grown organic apricots, nectarines, and peaches. Gift baskets available. Ferry Plaza, Saturdays. Give a little locally sourced sweetness with Marshall’s Farm’s honey straws, which make a colorful stocking stuffer. Their honey jar gift packs provide a sampling of local varietals such as Star Thistle, Orange Blossom, Napa Valley Wildflower, and California Sage Honey. Ferry Plaza, Saturdays. Lonely Mountain Farm is offering holiday wreaths and gift baskets that will contain three jars of preserved goods, such as strawberry jam, dilly beans, bread and butter squash, crushed heirloom tomatoes, pickled Mexican sour gherkins, and spicy dill pickles, complete with adorable hand-drawn labels. Ferry Plaza, Saturdays. Share the gift of good gut health with Volcano Kimchi gift bags of handcrafted napa cabbage, jicama, and radish kimchi. Kimchi maker Aruna Lee is also offering Korean-style chili sauces, which are made from scratch using chilis grown by Buddhist nuns in Kyung Sang Province, South Korea. Ferry Plaza, Saturdays. Heat up the holidays! Tierra Vegetables has plenty of gifts for the spice lover in your life, including hot sauces, chile jams and oils, and dried chiles, along with heirloom cornmeals, all sustainably grown and processed in small-batches at Lee and Wayne James’ farm in Santa Rosa. Ferry Plaza, Saturdays. Inspired by a family recipe, Happy Quail Farms’ Farm-Style Relish is a Good Food Award winner, with its tangy blend of mild and spicy peppers from David Winsberg’s suburban East Palo Alto farm. 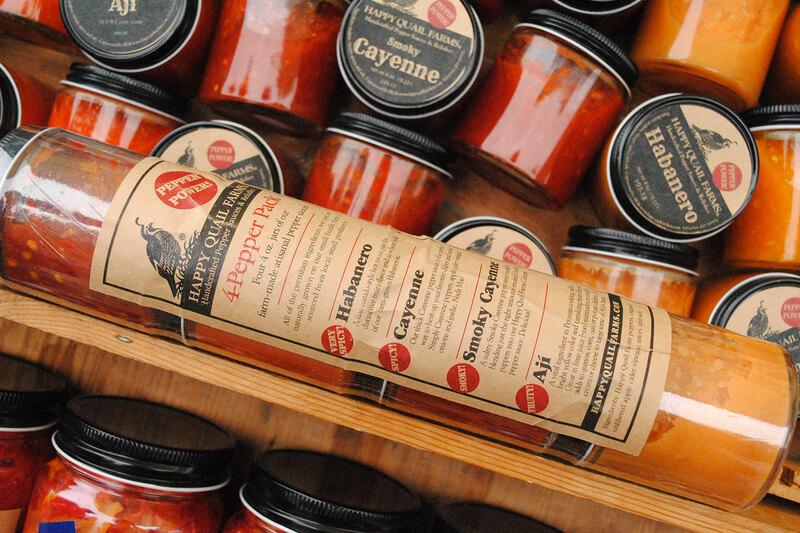 David also offers gift packs and boxes of his Wholly Mullies, Smoky Cayenne, and Habanero sauces. Ferry Plaza, Saturdays and Tuesdays. Fourth-generation farm Sciabica & Sons’ fresh flavored olive oils are made by cold-pressing lemons, jalapeños, basil, or fresh garlic with fresh California olives—no artificial flavors. The four-flavor gift pack makes a great host gift. Ferry Plaza, Saturdays. Based in Hollister, Big Paw Olive Oil Company offers a variety of extra-virgin olive oils and balsamic vinegars, in plain and infused flavors such as sweet Honey Balsamic Vinegar or spicy Hollister Heat EVOO. Their Seasons Greetings Balsamic Vinegar in Cheery Cherry, a blend of barrel-aged dark cherry and Mission fig balsamic vinegar with a dash of cardamom spice, makes a delicious drizzle on holiday feast dishes and desserts. Jack London Square, Sundays. Casa Rosa Farms is known for their pasture-raised meats, but they also offer olive oils fresh from their farm, as well as vinegars made with farm-grown ingredients like Brown Turkey Fig and Pomegranate. As part of Capay Valley Meat Collective, they share a stand with Pasture 42, who offers soaps, wool, and more. Ferry Plaza, Saturdays. Salmon lovers, Cap’n Mike’s Holy Smoke offers gift packs of their smoked salmon, salmon jerky, salmon sticks, and other smoked fish delicacies. Ferry Plaza, Saturdays. B-Y-O-Babka for Hannukah with Wise Sons Jewish Delicatessen’s cinnamon and chocolate babka loaves, made in SF. Their bagel chips and spice mixes (in brisket, shawarma, and everything blends) are go-tos for last-minute gifting. Ferry Plaza, Saturdays. Dot’s Baking Pantry has assorted pies, cakes, breads, and cookies with holiday packaging, all lovingly made and ready for host gifts and holiday baskets. Jack London Square, Sundays. Nana Joes Granola is known for their innovative, gluten-free granolas made in San Francisco using farmers market ingredients. Michelle Pusateri’s spiced almonds, cookies, and granola packs can be given as stock stuffers or bundled in a pre-packaged gift box. Ferry Plaza, Saturdays. Craftsman and Wolves candies are works of art unto themselves, as are their seasonal pastries like their Butternut Squash and Burnt Caramel Tart, Smoked Ginger Molasses Cookies, and Panettone. Ferry Plaza, Saturdays. Give the gift of warmth and good health this winter with loose-leaf teas from Yerba Buena Tea Co. For the holidays, they’re offering gift packs of three teas of your choice. All herbs and tea leaves are purchased through fair trade and organic farms and distributors. Ferry Plaza, Saturdays. Stocking stuffer for coffee lovers: East Bay-based Highwire Coffee Roasters’ 2016 Celebration is a culmination of the year, using small, exceptional lots of coffee to create a limited-edition winter blend that has “a zesty, candied fruit sweetness with a touch of spice and a smooth mouthfeel.” Ferry Plaza, Saturdays. Almanac Beer Co. is offering seasonal farm-to-barrel flavors like Pumpkin Pie and Bourbon Barrel Pêche to delight the beer lover in your life. Their Nectarine Cobbler sour blonde ale uses Blossom Bluff Orchards yellow nectarines blended with cinnamon, ginger, coriander, and vanilla bean to create a sippable “dessert in a glass.” Pair with mom’s baked desserts, Indian curries, and other holiday feast favorites. Ferry Plaza, Saturdays. Hidden Star Orchards has spiced cider, apple sauce, apple butter, and pure fruit juice extracts, which provide highly concentrated flavors for sauces, salads dressings, cocktails, and whatever other uses creative cooks can dream up. Ferry Plaza, Saturdays and Tuesdays. Add a holiday flair and bring home the scent of eucalyptus and other California grown plants with holiday wreathes from Devoto Gardens, Fifth Crow Farm, Four Sisters Farm and Cypress Flower Farm. Ferry Plaza, Saturdays. Season, taste, and freshen with Allstar Organics’ dried herbs, salts, sugars, and hydrosols, which beautifully bottle up the flavors and scents from their organic farm in Marin. Ferry Plaza, Saturdays. To pamper that special someone, Eatwell Farm has a whole suite of lavender sachets, scrubs, salves, hydrosols, essential oils, and other aromatic products. All of them are made with lavender and other items grown on their organic farm in Dixon. Ferry Plaza, Saturdays. Wisdom by Wisdom makes natural, handcrafted soaps and body butters in a wide variety of scents and colors, including poppyseed, oatmeal milk and honey, peppermint, and lavender. Sweet treats for your skin, her cupcake and cake slice soaps look and smell good enough to eat. Jack London Square, Sundays. Package all of your farmers market goodies in our seasonal tote bag, which makes a bold and functional fashion statement. Available for purchase at the CUESA Info Booth at all of our farmers markets. Can’t decide? We’ve got the perfect gift. Delight your friends and family by letting them choose their own delicious gift with Farmers Market Gift Coins. Gift coins work like a gift certificate, have no expiration date, and can be redeemed at any CUESA farmers market stand. They are conveniently pre-packaged in $25 boxes and $10 bags, but they are available in any amount. Market coins also make great corporate gifts. Stop by the Info Booth or call us to purchase. Learn more.